Originally published under the title, "Secure the Border! Saudi Arabia Building 600-Mile 'Great Wall' to Keep Out ISIS." Saudi Arabia began building a wall along its border with Iraq in September to prevent Islamic State fighters from infiltrating the kingdom. 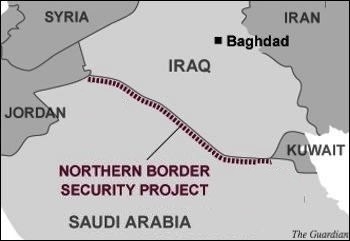 In a move reminiscent of ancient history, Saudi Arabia is building a 600-mile-long "Great Wall"—a combined fence and ditch—to separate itself from the Islamic State to the north in Iraq. The irony here is that those Muslims that Saudi Arabia is trying to keep out are the very same Muslims most nurtured and influenced by a Saudi — or "Wahhabi," or "Salafi" — worldview. Put differently, Saudi Arabia is again appreciating how jihad is a volatile instrument of war that can easily backfire on those who support it. "Holy war" is hardly limited to fighting and subjugating "infidels" — whether the West in general, Israel in particular, or the millions of non-Muslim minorities under Islam — but also justifies fighting "apostates," that is, Muslims accused of not being Islamic enough. Indeed, the first grand jihad was against Muslim "apostates" — the Ridda ["apostasy"] Wars. After Muhammad died in 632, many Arab tribes were willing to remain Muslim but without paying zakat ("charity" or extortion) money to the first caliph, Abu Bakr. That was enough to declare jihad on them as apostates; tens of thousands of Arabs were burned, beheaded, dismembered, or crucified, according to Islamic history. Accordingly, the Islamic State justifies burning people alive, such as the Jordanian pilot, precisely because the first caliph and his Muslim lieutenants burned apostates alive, and is even on record saying that "false Muslims" are its first target, then Israel. Saudi Arabia is the chief disseminator of the Salafi ideology most associated with jihad. This is the problem all Muslim nations and rulers risk: no one — not even Sharia-advocating Islamist leaders — are immune to the all-accusing sword tip of the jihad. If non-Muslims are, as "infidels," de facto enemies, any Muslim can be accused of "apostasy," instantly becoming an enemy of Allah and his prophet. A saying attributed to the Muslim prophet Muhammad validates this perspective: "This umma [Islamic nation] of mine will split into seventy-three sects; one will be in paradise and seventy-two will be in hell." When asked which sect was the true one, the prophet replied, "al-jama'a," that is, the group which most literally follows the example or "sunna" of Muhammad. This saying perfectly sums up the history of Islam: to be deemed legitimate, authorities must uphold the teachings of Islam — including jihad; but it is never long before another claimant accuses existing leadership of not being "Islamic enough." Enter the Saudi/Islamic State relationship. Initially, the Arabian kingdom (or powerful individuals within it) was a supporter of the Islamic State. It was not long, however, before IS made clear that Saudi Arabia was one of its primary targets, calling on its allies and supporters in the kingdom to kill and drive out the Saud tribe. Nor is this the first time the Saudis see those whom they nurtured — ideologically and logistically — turn on them. Back in the 1980s, the Saudis were chief supporters of the jihad against the Soviets in Afghanistan. But once the "distant" infidel was subdued, al-Qaeda and its Saudi-born leader Osama bin Laden came home to roost, doing the inevitable: pointing the accusatory finger at the Saudi monarchy for not being Islamic enough, including for its reliance on the great American infidel during the First Gulf War. 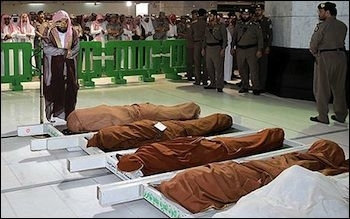 Moreover, Saudi Arabia is not only a chief disseminator and supporter of the Salafi ideology most associated with jihad, but the Arabian kingdom itself was forged in large measure by articulating and calling for holy war in the 19th and 20th centuries, including against Turks and fellow Arab tribes (both Muslim). The Saudi argument then was the very same argument being made by the Islamic State now — that the rulers of Islam's holiest mosques in Mecca and Medina (then, the Ottoman Turks) were not "Islamic" enough. Such is the double-edged sword of jihad. All Islamic governments, regimes, and kingdoms must always try to direct this potent instrument of war against enemies or neutral targets — preferably ones far away from their borders (Afghanistan, America, etc.). For they know that the longer the jihad waxes in strength and goes uncontained, the more it becomes like an all-consuming fire indiscriminately scorching all in its path. This also explains why Saudi Arabia is a chief funder and supporter of external jihads: better to send its own zealots out of its borders to fight distant infidels than have them stick around (a "better them than me" mentality). It also explains why nations like Saudi Arabia, which were forged by the jihad, continually find themselves threatened by the jihad — or, to paraphrase a young Jewish rabbi: "Those who live by the sword will die by the sword."